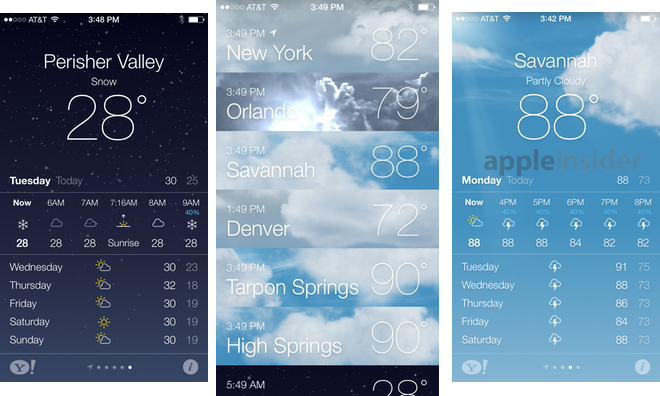 One of the most significant aesthetic changes in iOS 7 is found in the iPhone's native Weather application, which has been redesigned with moving three-dimensional graphics that illustrate the current conditions. Before opening the Weather application, testers of the first iOS 7 beta will notice that the icon no longer has a static indicator of 73 degrees. That potentially confusing decision, which lasted for years on the iPhone home screen, has been removed, and the new icon simply shows a cartoonish sun partly covered by a cloud. 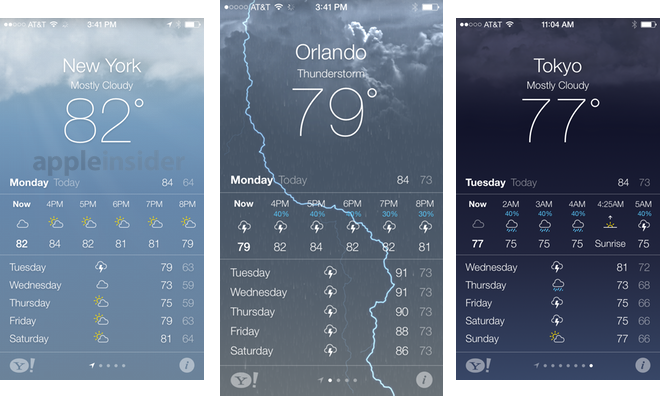 Upon opening the application, the changes are immediately apparent: The entire background is an animation mimicking the current weather conditions. On a mostly sunny day, clouds will slowly drift by, while thunderstorms will bring down strikes of lightning from the virtual sky. The animations even reflect the current time, with darker nighttime animations and brighter conditions during the daylight as clouds float or snow falls. Tapping on the city and current temperature up top flips the display to a more detailed view. There, humidity, chance of rain, wind speed, and a "feels like" temperature can also be viewed. Below that, an hour-by-hour breakdown of weather conditions can be viewed. This information can be scrolled to the left to view projected weather further into the future, including temperature and likelihood of rain. At the bottom of the Weather display is a forecast for the coming days. Projected conditions and temperatures are listed for the next five days. As it has been since the first iPhone launched in 2007, the weather data is provided by Yahoo, and a link to its website resides in the bottom left. 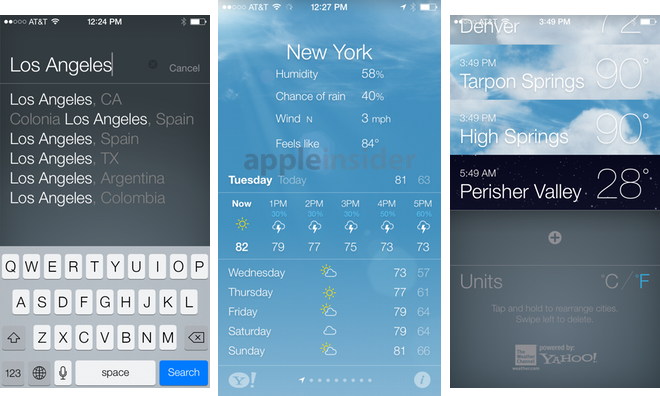 An "i" button in the bottom right allows users to view all of the favorite cities they have saved in the Weather app, and add new locations. When viewing favorite locations, users can view local times and current temperatures, while the familiar animations for respective conditions also play in the background. On a 4-inch iPhone 5 display, a total of six and a half cities can be viewed at once at this screen. The weather "widget" included in the pull-down Notification Center menu has also been overhauled. Weather is now presented in a screen that offers users what is essentially a summary of their day, including any calendar appointments and relevant traffic data. The Notification Center no longer shows a graphic with current and future weather conditions. Instead, the information is simply a sentence that briefly summarizes the weather. Currently available for developer testing, iOS 7 is scheduled to arrive for iPhone, iPad and iPod touch this fall. For more on Apple's next mobile operating system, see AppleInsider's ongoing Inside iOS 7 series.